The lecture is free and open to the public. Shalala will be joined in conversation by James B. Steinberg, dean of the Maxwell School and former U.S. Deputy Secretary of State. 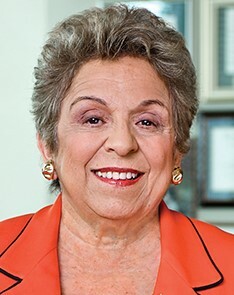 A Maxwell School graduate, having earned master’s and doctoral degrees in social science, Shalala has built an eminent career in both higher education and federal government. From 1993-2001, she served in the Clinton administration as the U.S. Secretary of Health and Human Services, the longest serving HHS secretary in U.S. history. She was then named president of the University of Miami, a post she held until June of this year. Over the summer, she assumed her current post as president and CEO of the Clinton Foundation. In higher education, Shalala has also served as chancellor of the University of Wisconsin-Madison and president of Hunter College (City University of New York). In government, she had served previously in the Carter administration as assistant secretary for policy development and research at the U.S. Department of Housing and Urban Development. Shalala has won the Presidential Medal of Freedom, the Nelson Mandela Award for Health and Human Rights, the National Public Service Award and the Harry S. Truman Legacy of Leadership Award. She was named Glamour magazine’s Woman of the Year and one of U.S. News and World Report’s America’s Best Leaders. She is a member of the National Women’s Hall of Fame and has received more than four dozen honorary degrees (including an honorary degree from Syracuse University in 1987). Shalala was one of the nation’s earliest Peace Corps volunteers (Iran, 1962-64). The Tanner Lecture Series on Ethics, Citizenship and Public Responsibility provides a public forum for exploring questions about ethical citizenship in provocative and challenging ways. The series has been generously endowed by alumnus W. Lynn Tanner ’75 PhD, founder, CEO and chairman of TEC Canada, a leadership development organization dedicated to accelerating the growth and development of outstanding 21st-century leaders. The lecture series is coordinated by the Campbell Public Affairs Institute at the Maxwell School.